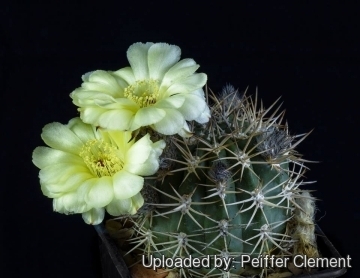 Acanthocalicium (Lobivia) thionanthum var. brevispinum. The variety name ''brevispinum'' means ''short spines'' and it was originally applied to the short spined form of this very variable taxon. Origin and Habitat: Origin: Argentina (Salta) Grows on mountain slopes. Description: Usually solitary or slowly branching through basal shoots, but quite variable taxon with several forms. 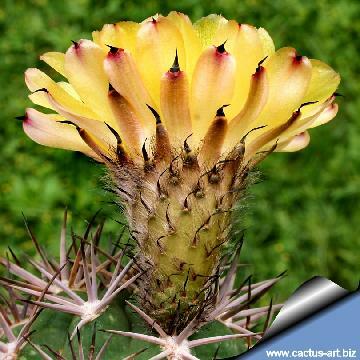 There are a number of varieties of this highly variable cactus species, but not all are universally recognized. Areoles: At the apex of tubercles, at first are covered with yellowish-brown felt. The flower part of the areola is elongated, while the upper part curves around the sides of the rib, more or less in the shape of a small shield. As the tubercles widen in the course of growth, the areoles become elliptical and almost glabrous. 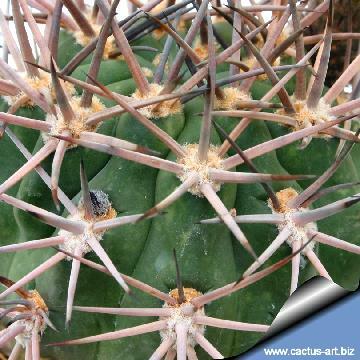 Spines: 5 to 10 radial spines and 1 to 4 central spines, they are all more or less of the same length in a given plant (± 0,5 -3 cm. ), but this species appears to be very variable regarding the length colour and number of spines in different populations. They are usually black or light brown at first, becoming grey or whitish-yellow as they age. The variety "brevispinum" has comparatively short and strong sharp spines. Flowers: Bell-shaped, 5 cm. long or less on lateral areoles, and the segments of the perianth are sulphur or lemon-yellow (but also white, orange or red), They have very hairy buds, The floral tubes have brown-white hairs /bristles and dark spine-tipped scales. Acanthocalycium thionanthum var. copiapoides Piltz: The variety "copiapoides" has comparatively clearer grey-blue epidermis and looks like some plant of the genus Copipaoa. Echinopsis brevispina (F.Ritter) H.Friedrich & G.D.Rowley: The variety "brevispinum" has comparatively short but strong sharp spines. Echinopsis chionantha (Speg.) Werderm. : This is the white flowering form of Echinopsis thionantha. 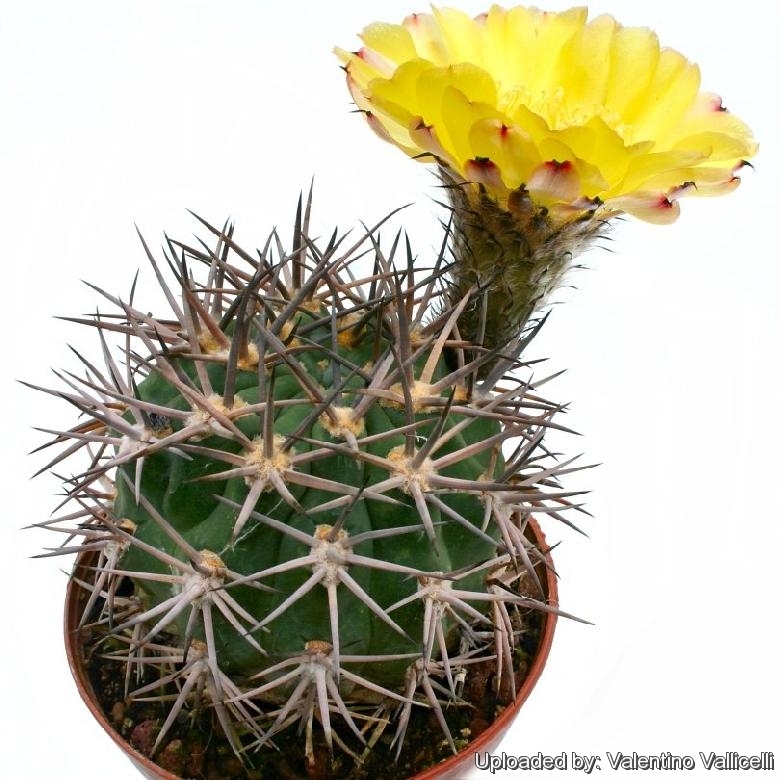 Echinopsis thionantha (Speg.) D.R.Hunt: The specific name "thionanthum" was originally applied to the yellow flowering form, but now comprises plant of variable colour of flowers and spines sizes. Cultivation and Propagation: It is an easy to grow succulent, more cold tolerant than most and less fussy regarding soil conditions. 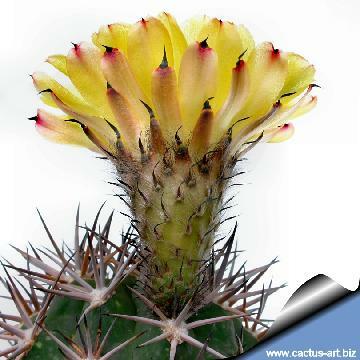 Exposition: Outside bright sunlight or afternoon shade, inside it needs bright light, and some direct sun, full sun is indispensable to keep plant compact with strong spines.